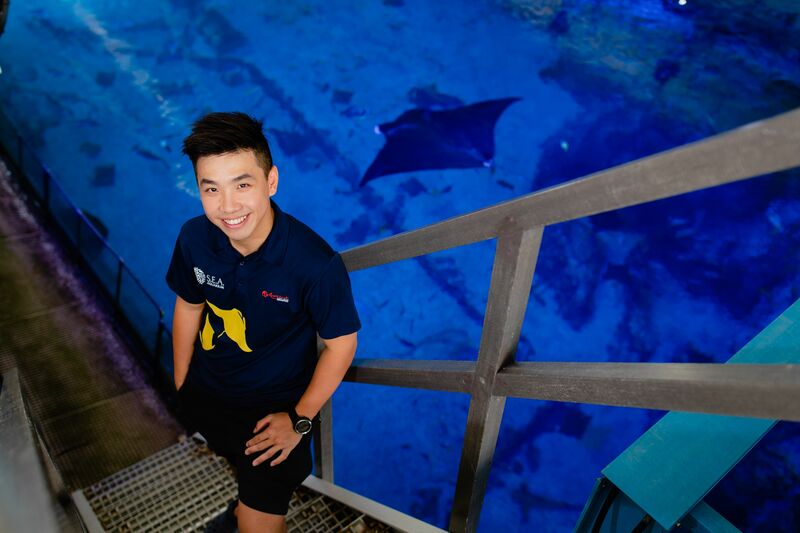 From a young age, aquarist Delon Wee, now 29, has wanted to save the world. But his heroes were not the caped crusaders from comic books, performing impossible feats of strength or valour. Instead, they were the likes of conservationists Steve Irwin and David Attenborough. Through their documentaries, Mr Wee found himself fixated on the work of marine biologists; those unsung heroes who worked tirelessly to upkeep entire marine ecosystems, maintaining the delicate balance necessary for the survival of countless species. “Watching their documentaries made me realise how we are damaging the ocean, and how much our species contributes to climate change,” he says. As such, he did everything he could to facilitate his future in this direction, so he could become just like the men and women he so admired. He began keeping freshwater fish tanks at home for hands-on experience, and even took biotechnology classes in polytechnic. But when he first started searching for a school in which to pursue marine biology after his national service, the prospects were bleak: The institutions he had set his sights on were all out of reach, as he lacked the finances to study abroad. But as he was riding the MRT one day in early 2012, an advertisement caught his eye. “Bachelor of Business and Environmental Science,” it read. And beneath that: the unmistakable logo of James Cook University (JCU). Mr Wee’s curiosity was piqued. JCU was one of his top choices, due to its reputation of a stellar marine studies faculty, among other things. But until that moment, he had not realised that he could pursue a degree in environmental science at the Singapore campus. His heart leapt. Half a year later, he was enrolled in the Bachelor of Business and Environmental Science programme at the Singapore campus of JCU — officially taking the next step on his journey towards becoming just like his heroes. The Bachelor of Business and Environmental Science offered at James Cook University aims to, in the words of its course coordinator Neil Hutchinson, train students who are “bilingual in both business and science”. Modules range from highly specialised environmental science modules like Environmental Processes and Global Change to corporate-focussed subjects like Economics for Sustainable Business and Contemporary Business Communications. Students also have a range of electives to choose from, allowing them to supplement their core curriculum with additional specialised knowledge in aquaculture, marine biology and marine ecology, among others. The two-year full-time programme was developed in response to an emerging need for businesses to understand and manage their environmental impact in order to maintain their base of clients, Dr Hutchinson explains. Graduates of the programme will be equipped to fill emerging openings in the sustainability job market, which is seeing rapid expansion both regionally and internationally. These openings range from environmental advisers for businesses, to non-governmental organisations, to management positions in the aquaculture industry. Upon graduation, Mr Wee found himself drawn to the S.E.A. Aquarium at Resorts World Sentosa, working in the sea jellies and coral exhibits. There, he specialised in coral husbandry, working on projects like coral propagation, coral quarantine and aquascaping. 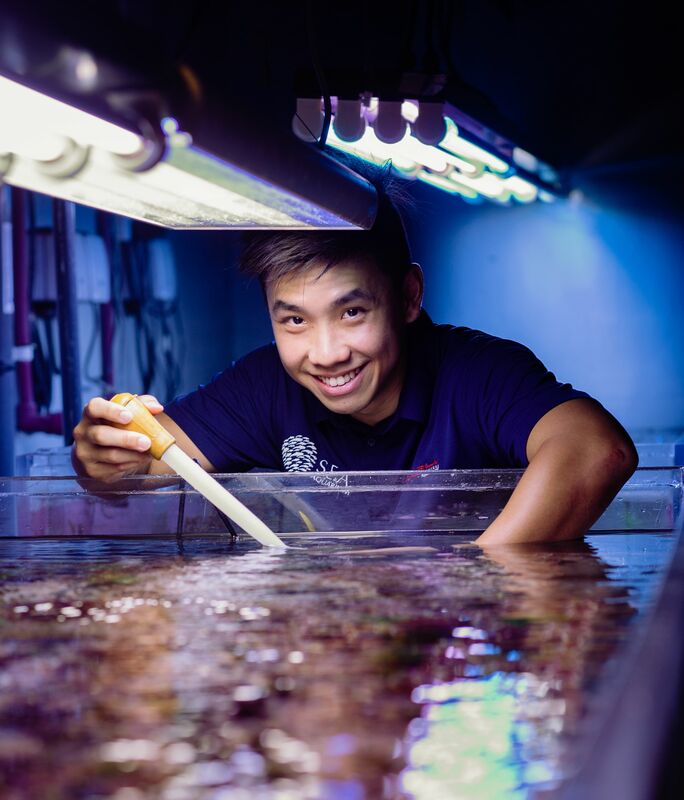 Two years later, wanting to try his hand at research, he moved on to the Tropical Marine Science Institute at the National University of Singapore, for coral rehabilitation. His primary job was to transplant wild coral colonies onto artificial structures like seawalls and coastal barriers — a natural progression from his past experience in coral husbandry. Finding himself wanting to do more hands-on work with marine wildlife, he found himself back at the S.E.A. Aquarium after another two years, but in an entirely different department than before: large exhibits. His new role has him taking care of the largest animals that call the S.E.A. 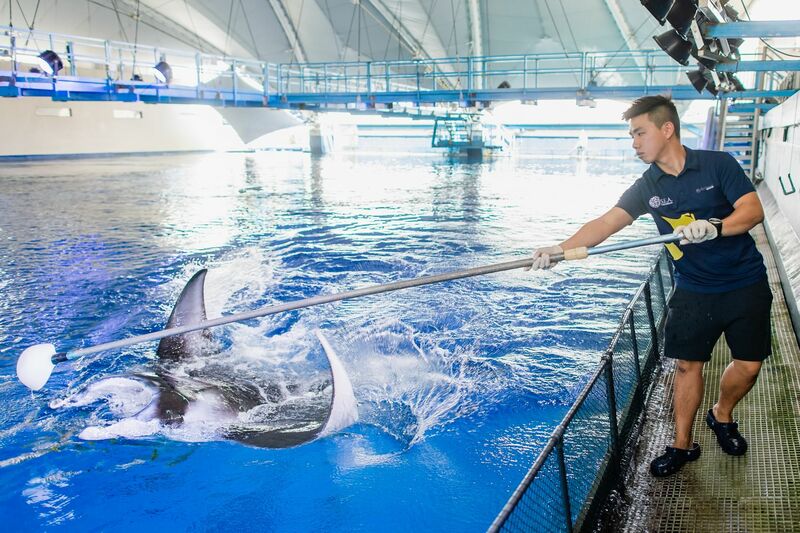 Aquarium their home, including sharks, manta rays and groupers, as well as planning enrichment activities with them. While he currently has no plans to be anything other than an aquarist — he eventually hopes to become a curator at the S.E.A. Aquarium — he is confident that his educational background in business would make transitioning to a business-related job easy. “My degree definitely set the foundations for me to become a consultant or some other business-related role,” he says. But Mr Wee emphasises that it is not just what he learned in the classroom that helps him in his daily life. It was also the soft skills he picked up from JCU that made all the difference. “The school taught me various skills and knowledge required for the life of a working adult,” he says. In particular, he has come to realise the importance of a multicultural tertiary education, such as that offered by JCU. One might be surprised at how passionate aquarists can get over the best way to care for animals, which can sometimes spark conflict, he continues with a laugh. But thanks to JCU, he learned valuable things about conflict de-escalation and resolution. He makes it a point to facilitate discussion, reminding them that everyone is ultimately looking out for the welfare of the animals. This makes it easier to understand the perspectives that everyone else is coming from. Not all conflicts are so easily settled, of course, but Mr Wee says that the working relationship with his team only gets better each time. Head down to the Singapore campus of James Cook University on 27 Apr 2019 for their Open House, and learn how you can be the answer to problems that plague the world today.